Contact Eric Ray to bring this training course to your conference. 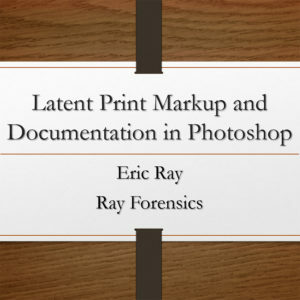 Eric Ray has been a Forensic Scientist in the Latent Print field since 2007 and is a Certified Latent Print Examiner. He earned a BS in Biochemistry and Molecular & Cellular Biology from the University of Arizona. As a member of the IAI, Eric is on the Editorial Board of the JFI. Eric has chaired the IAI Special Committee on Latent Print Probability Modeling and was a member of the OSAC Friction Ridge Subcommittee. Eric has published and presented extensively on Reducing Erroneous Exclusions. In his spare time he also co-hosts the Double Loop Podcast, an online program on fingerprint topics.